First of all, get a tour of your gym if you’re a new member. Ask any and all questions you may have. Get a schedule of the classes they offer. This can help you start to decide where you’d like to spend your time within the gym while working out. If you aren’t experienced with working out, you may want to hire a personal trainer to help you make a workout routine. Often, the first session is free so you can get an idea if hiring a personal trainer would be right for you. They can help you learn to use the machines, make a workout plan that is right for your exercise level and current health as well as motivate you to keep coming in. Try everything you can to decide what type of exercise you like the best. A great way to start doing this is to make a plan for different times you’d like to come in. Depending on how many times a week you’d like to work out, try the treadmills and ellipticals one day. Try several arm machines another day, leg machines the next day and ab machines another day. Try out a few classes that sound interesting to you. Go swimming if they have a pool. Once you test all of the machines and classes, you can decide what workouts you love and will help you stick with exercise. Once you’ve decided what types of exercises you love, schedule it in your cell phone or planner. Make sure to mix up your workouts so your body and mind don’t get used to the same old routine. Enlist a friend to come with you as a workout buddy. A lot of gyms offer memberships that allow you to bring guests for free or a small fee. Take advantage of it! 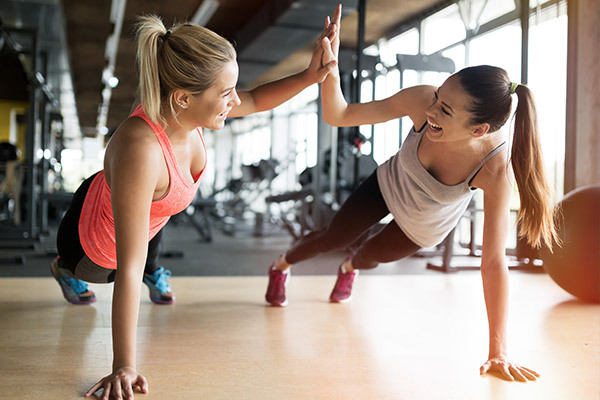 It can be a lot easier to complete a workout when you have a friend to motivate you or be competitive with. Do you work out a gym? Have you ever thought about joining a gym but wouldn’t know what to do once you got there? Will you try any of these tips? Let us know!